Spammers on Twitter and FriendFeed: Really a Problem? Spam is a well-known issue in the email world. Personally, I’ve set up an email account used specifically for some online applications requiring an email address, just to manage the inevitable spam that will result. Spammy comments on blogs are also an issue, which Askimet handles nicely on wordpress.com. 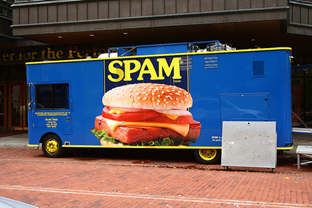 But is spam an issue on Twitter and FriendFeed? You know you’ve made it as a communications medium when you start attracting spammers. On Twitter, the problem is getting bad enough that the service is starting to blacklist people who spam other members. Am I missing something here? If someone is spammy on these services, you simply unsubscribe. This isn’t email. Someone can’t start sending you spam on Twitter or FriendFeed just because they have your member URL. I do see spammers subscribe to me on Twitter, but I never subscribe back. I don’t see their spam. I can understand the service providers wanting to manage this. But for members, the beauty of these tools is their permission-based nature. You can’t spam me unless I let you. UPDATE: Good discussion of this on FriendFeed (here). Mitchell Tsai notes the possibility of comment spam on FriendFeed. 7 Responses to Spammers on Twitter and FriendFeed: Really a Problem? I don’t have a problem with spam on Twitter nor FF. I handpicked who I follow. Also, like you said, I quickly unfollow noisy tweets/posts. I get all the control with those two services. This isn’t email. Someone can’t start sending you spam on Twitter or FriendFeed just because they have your member URL. Both sites default to emailing a user whenever someone follows them, hence the spam caused by people following you. And it should be noted that FriendFeed comment spam can be tamed via moderation. (b) spammers signing up for FriendFeed and adding all kinds of links in their account that point to their sites. Since Google crawls FriendFeed, the spammers can start ranking well for keywords. del.icio.us/popular used to have spam problem. They simply fixed it by making all outbound links as nofollow. FriendFeed outbound links are not no-follow so they are open to abuse by spammers. Absolutely. Both are easy to control & spam-filter when they get too noisy or silly! I agree that, in regards to Twitter in particular I just can’t see a major spam issue. The set up of the service just doesn’t lend itself well to any kind of unavoidable spam. FriendFeed can be slightly more problematical in regards to comment spam as highlighted by others above. That may develop into a problem – particularly given that commenting/liking are an important part of developing networks through FriendFeed beyond those that you initially follow.